As the days grow longer and the weather gets warmer in Baltimore, it is the perfect time to get outside and explore the city. Take advantage of the free Charm City Circulator bus, which has five routes that traverse the heart of the city. And if you don’t want to figure out the bus routes, an Uber downtown usually costs somewhere in the $30 range, which is reasonable if you are splitting the fare with a few friends. Another option is to hop on a Bird, Lime, or Spin electric scooter, which you can activate from an app and is a really fun way to zip around the city. The Promenade is one of the best places to be downtown on a nice day. 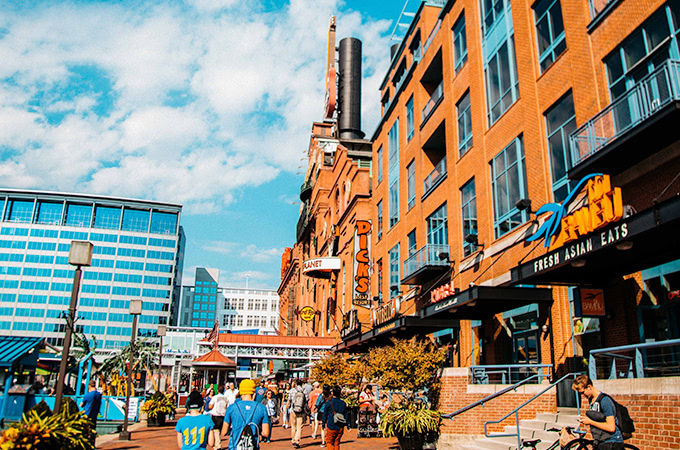 The piers that flank the Inner Harbor feature different things to do, see, and eat, and the Promenade offers miles of uninterrupted waterfront walkway for pedestrians. 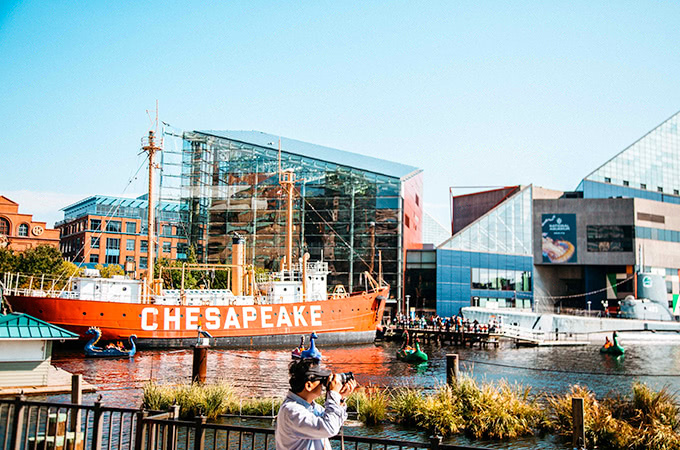 You can start at the National Aquarium, one of the top aquariums in the country. I went there with my family when they came for Family Weekend, and we were all impressed by the exhibits and the aquarium itself. After spending some time admiring the jellies, stingrays, and sharks, my recommendation is to enjoy lunch at an outdoor table at Shake Shack, right across the street. Walk along the water towards the main part of the downtown area, where street performers occasionally dance, act, play music, and perform magic. You can also rent paddle Dragon Boats by the hour. There are also places that rent stand-up paddle boards and kayaks for a few hours. Being out on the water is one of the best ways to see the harbor. Pier 5 is home to the historic Seven Foot Knoll Lighthouse, which was built in 1855 and is the oldest screw-pile lighthouse in Maryland. It is considered a beacon of the Chesapeake Bay, because it used to mark the mouth of the Patapsco River, the river that leads to Baltimore’s Harbor. Continue along the walking path and stop at MECU Pavilion, where you can usually hear a live outdoor concert underway. Finish up your visit with a stop at Ra Sushi Bar, which has some of the most unique (and tasty) sushi in the city—or head into historic Fell’s Point and walk along the water for several more miles to Canton Waterfront Park, where you’ll probably find a free outdoor yoga class under the stars. 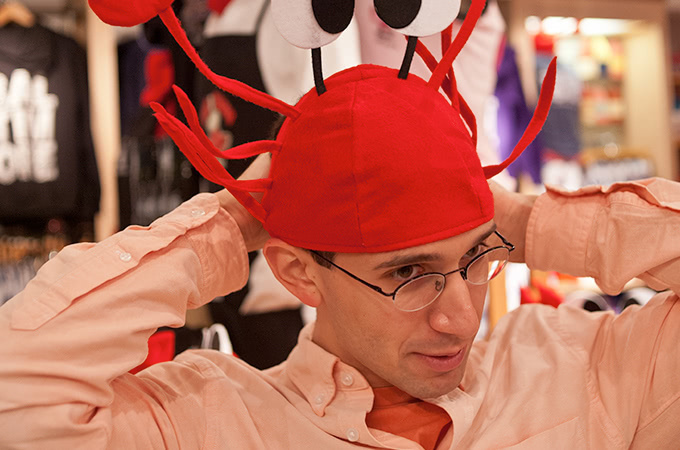 Whether you venture to Hampden for a cone of Maryland Mud ice cream from The Charmery, stroll the boutique lined cobblestone streets of Fell’s Point, or check out a bocce ball game after eating a plateful of gnocchi in Little Italy, there are so many unique neighborhoods that make up Baltimore. 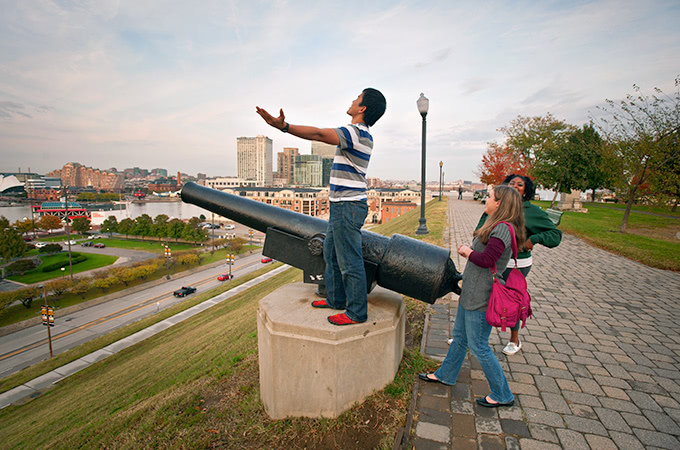 One of my favorites is the Federal Hill neighborhood, home to the Federal Hill park that offers one of the best views of the Inner Harbor—and a blast from the past and our nation’s history. There are several restaurants within walking distance from each other, including Cross Street Market, one of the country’s oldest public markets. Check out Abbey Burger Bistro (owned by two fellow Greyhounds!) and build your own burger. 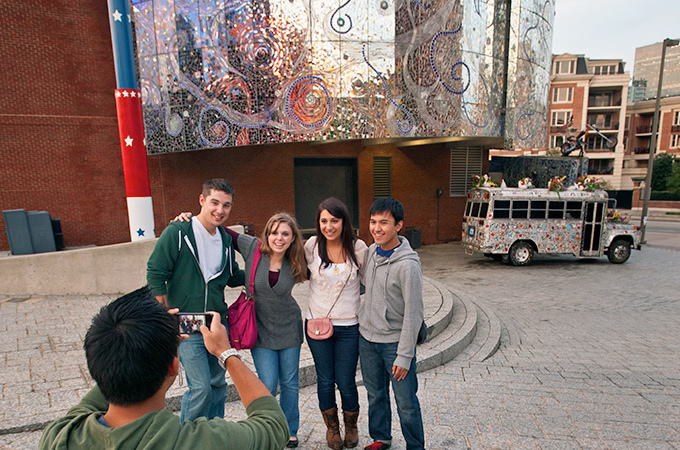 The American Visionary Arts Museum, which offers reduced admission for students with a valid student ID, is also in this neighborhood. 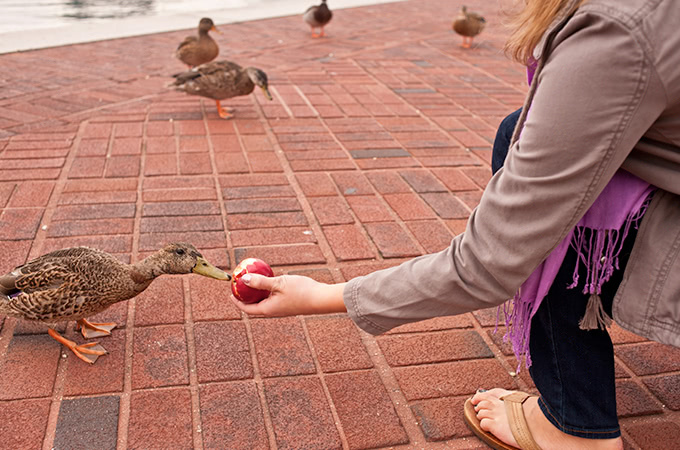 If you’re in the mood to throw a football, have a picnic, or go for a walk along the water on a pedestrian/bike path with a historical backdrop, the grounds of the Fort McHenry National Monument are a great place to spend an afternoon. You can’t go to Loyola for four years without going to an Orioles game. O’s games provide a great experience, even for the novice baseball fan. You get to root for a professional sports team—at prices college students can afford. And April and May are an ideal time to do it. 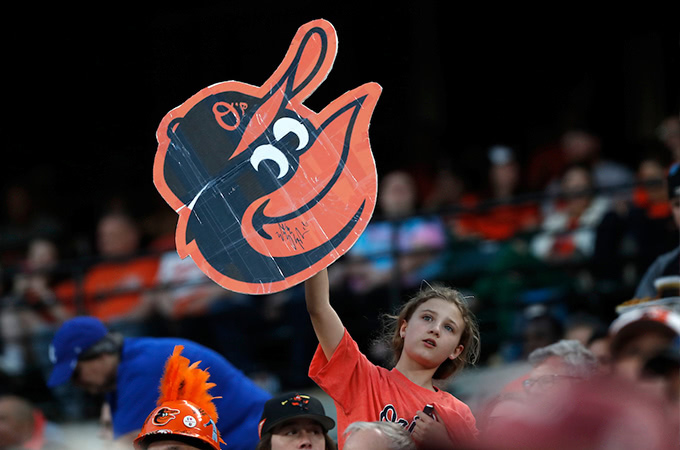 If you want to go down to the city and watch your favorite team play the hometown Orioles, you can get bleacher seats for less than $20. The food at Camden Yards is, in my opinion, some of the best stadium food in the country, featuring regional favorites from Baltimore restaurants. Camden Yards is a beautiful park and the atmosphere is really cool. I highly recommend going to at least a few games before the school year lets out (and if you miss out this spring, there are games through August and September when you return to Loyola for the fall semester). On the last Friday of every month, hundreds of people take to the streets wearing themed costumes on their bikes for Baltimore Bike Party. This two-hour ride is an amazing way to meet people and to see the city from a totally different vantage point—and every month, the Bike Partiers ride a different route. Baltimore Bike Party is organized by a group of volunteers and is free and open to people of all levels of bike experience. (Don’t own a bike? You can rent one from a local bike shop, like Race Pace or Joe’s Bike Shop!) This is worth trying at least once during your time at Loyola. 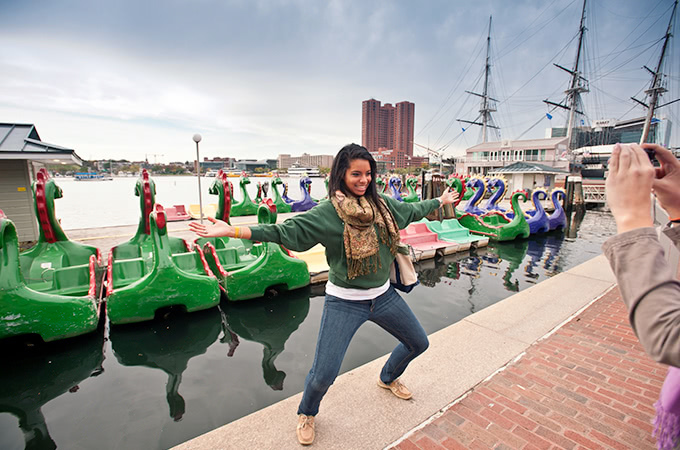 It is really fun, and quintessentially Baltimore. 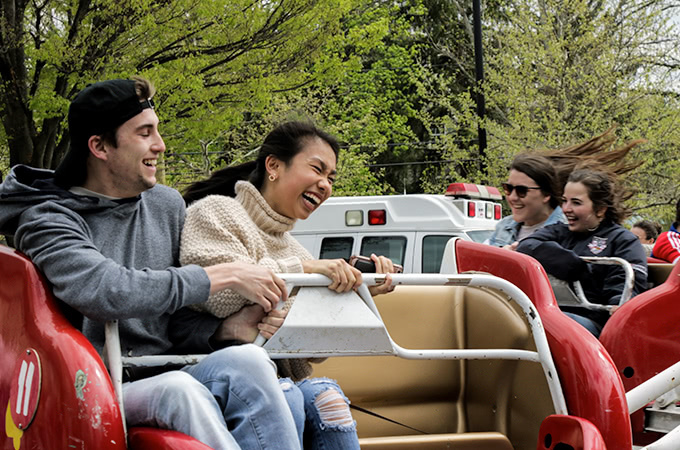 While there’s so much to see and do in the city, there is always something happening on campus throughout the spring months. My friends and I joke that Loyola’s student population doubles when temperatures hit 60 degrees, because the student body is way more inclined to do things outdoors. 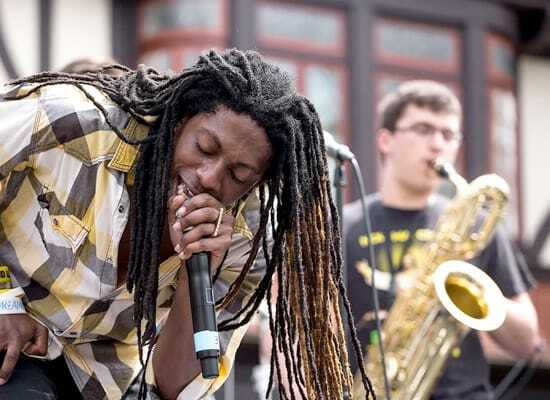 Annual events include things such as Loyolapalooza, a free outdoor music festival with free food and carnival rides. 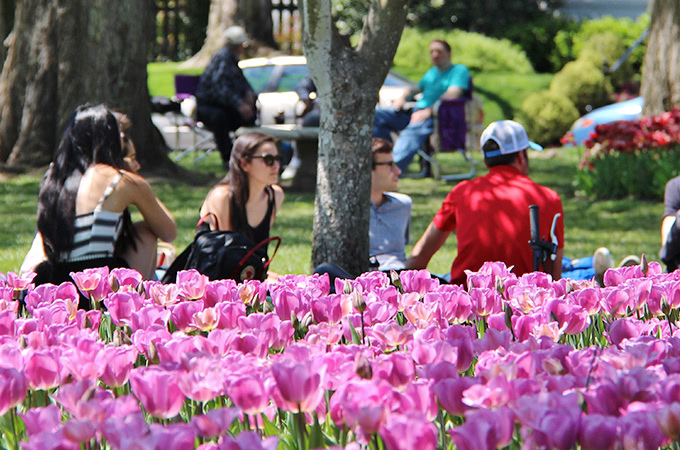 Or take a walk to the neighborhood across Cold Spring Lane and head to Sherwood Gardens, famous for its tulips and a great place to hang out in the sunshine on a blanket in the grass, read a book and relax, or take Instagram-worthy photos. 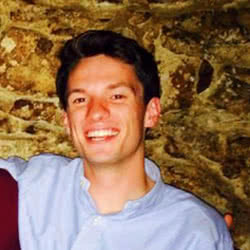 Teddy Mosher, ’16, received his bachelor’s degree in marketing from Loyola University Maryland. 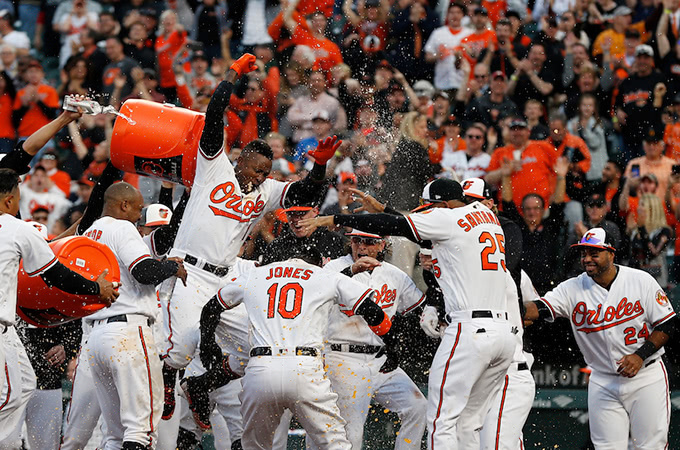 As a student, Teddy served as an assemblyman for the Student Government Association and as a DJ on WLOY Loyola Radio; his internship senior year with the Baltimore Orioles began his career in marketing. The Boston native has worked in event planning, data analysis, project management, and marketing strategy, and most recently returned to his alma mater as assistant director of alumni engagement at Loyola.